2012 Jun 27 - SL9B "Heart Gravel" exhibit was mentioned at The Virtual Building Company blog. 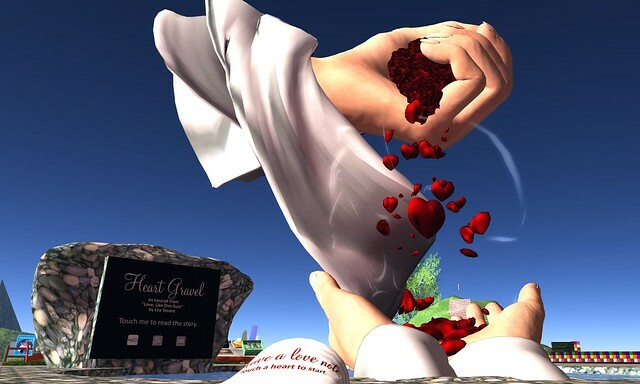 "Scale was also a theme for Opal Lei in her build "Heart Gravel" where prim hearts tumble into beautifully sculpted open hands..."
2012 Jun 21 - A photo of the SL9B "Heart Gravel" exhibit was included in the Caminante de Sueños blog (fourth photo down). 2012 Jun 24 - Opal Lei did a book reading at the SL9B Auditorium. 2012 Jun 18-27 - Book publicized at the SL9B with an exhibit called "Heart Gravel". 2012 Jun 15 - Lea was interviewed at XZBN about the book. 2012 May 4 - Jujudoll Dancer blogged about the book in the MODA Modeling School blog . 2012 May 4 - Book released on Amazon Kindle.